Eventrics, a term I have coined, is the theory of events and their interactions. Up to now, I have almost entirely given my attention to the ‘micro’ end of Eventrics, that is to Ultimate Event Theory, an ‘ultimate event’ being the smallest possible event, roughly the equivalent of an atom or elementary particle. But it is now time to turn to ‘macro-Eventrics’ and, in particular, human power politics. Any principles that underlie massive human-directed complexes of events have, on the face of it, little or nothing to do with the sort of things I have been discussing up to now ─ but that is just as true of matter-based physics when we shift from the world of the electron to the world of matter in bulk. As a disbeliever in continuity, I ought to be prepared for such a difference, but I would never have expected it to be so large. It is notoriously difficult to say exactly what this extra ingredient is, which is why reductionist theories have, in the last two hundred years or so, decisively gained the upper hand over ‘vitalist’ or ‘system’ theories. For the moment, the question of how and at what exact scale groups of causally bonded ultimate events start behaving in a qualitatively different manner from their individual components will be laid aside. In the last post I mentioned a few features of power politics viewed from the standpoint of Eventrics and, in particular, enunciated the basic doctrine that “it is events, not human beings that drive history”. I stressed the importance of a so-called ‘tipping point’ or ‘moment of opportunity’ in the fortunes of famous individuals. Persons become powerful, so I argued, not because they have outstanding intelligence, looks or charm ─ though clearly such things are assets ─ but because they (1) “fit the situation they find themselves in” and (2) because they seize with both hands the passing opportunity that presents itself (if it presents itself). I also advanced the notion that the recommended way to seize power and hold it is based on two, and essentially only two items, which are summed up in the codeword used by the US for the invasion of Panama : “Shock and Awe”. “Victor Hugo, a child of one of Bonaparte’s generals, was later to write: Nothing is more powerful than an idea whose time has come. It is equally true to say : No one is more fortunate than a man whose time has come. Bonaparte was thus favoured by fortune and the timing of the parabola, and he compounded his luck by the alacrity and decision with which he snatched at opportunities as they arose”. Exactement, c’est ça. Certainly, the author would seem to be wholly in agreement with the ‘First and Second Principles of Eventrics’. I then wondered how some of the other general principles I tentatively outlined applied to Napoleon. Did he have his ‘moment of opportunity’? Did he apply “Shock and Awe” as his principal methods? In fact, yes, on both counts but first let us enquire a little more into the thesis that it is not the man who commands events but rather the events that offer the opportunity to the man. This is not quite the same thing as saying a successful person is ‘lucky’, though as a matter of fact a surprising number of very successful people do say this, and not out of modesty. If we exclude Russia as being somewhat out on its own, and thus Stalin, the three most powerful non-elected individuals in Western history are Cromwell, Napoleon and Hitler. It is worthwhile examining their backgrounds carefully. None came from a rich, well-educated, aristocratic background ─ but none of them came from a working-class background either (Note 1). Oliver Cromwell, though distantly related to Henry VIII’s all-powerful minister Thomas Cromwell, came from the ‘lower gentry’ and even for a while apparently worked his own land. He did attend Oxford for one year but made no sort of mark there. More to the point, he had absolutely no formal military training, perhaps a blessing in disguise since it forced him to improvise and innovate. As for Hitler, he was the son of an Austrian Customs Official and had at least enough education to be able to present samples of his work to the Viennese School of Architecture (which twice refused him). Bonaparte’s family were small-time impoverished Corsican gentry turned lawyers “just rich enough to own their own house and garden and employ servants” as Johnson puts it. Coming from the lower gentry or the ‘upwardly mobile’ lower middle class can actually an advantage if you have your eye on the heights : such persons have enough of a leg up to obtain one or two useful contacts and a minimum of education but not enough to spare them the titanic effort needed if they want to seriously improve their condition. Of the three ‘dictators’ Napoleon was without a doubt the most talented in the ‘normal’ sense of the word. He had outstanding powers of concentration and application and a memory for “facts and locations” that never ceased to astonish people; he was a better mathematician than any Western ruler I can think of and such a good map-reader that he would be considered a ‘genius’ if we treated cartography on a level with, say, astronomy . At school he was not quite a prodigy ─ real prodigies rarely achieve anything in later life ─ but he was not far short of being one. Whereas the military training at the ‘Ecole Militaire, Paris, usually took two or three years, Napoleon passed all his exams in a single year and qualified as a 2nd Lieutenant at the ripe age of 16. His examiner in mathematics was the world-famous mathematician and astronomer, Laplace. So, what would Buonaparte have been in another time and place? There have been extremely few eras in history when talent alone could win out over entrenched interests and tradition. All three of our ‘dictators’ came to power in extremely uncertain times, Cromwell during the English Civil War, Hitler during the chaotic post-war German Weimar Republic and Napoleon himself emerged from obscurity after the most famous revolution of all time. Even so, Napoleon, as a ‘provincial’ with a Corsican accent, an obscure titre de noblesse that his fellow students didn’t take seriously, and no family money, nearly missed the boat since most of the best places were already filled by the time Napoleon came to the notice of the democratic clique that ruled France from the centre of Paris. At one point he thought of offering his services to the Sultan or emigrating to India where he might well have been a rather less successful Clive ─ less successful only because France did not bother so much about India as England did. In other words in another time and place, Buonaparte would certainly have been something, but equally certainly he would not have been Napoleon. As countless historians have pointed out, had Napoleon been born a decade or so earlier when his native Corsica was owned by Genoa, he would not have been a French citizen at all and so would not have qualified to become a boursier (paid student) first at Brienne and later at the Ecole Militaire in Paris. 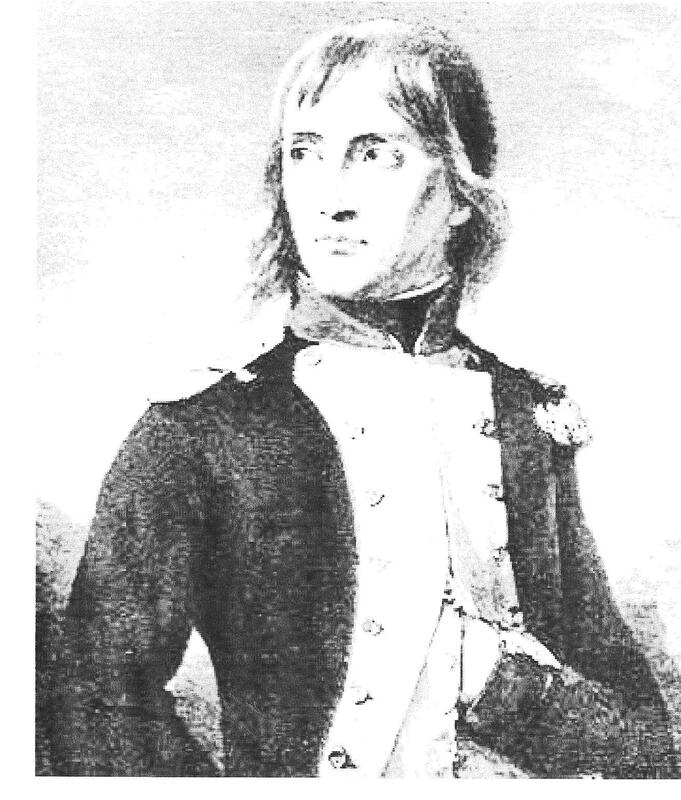 The teaching seems to have been pretty good and by a second stroke of luck, the young officer shortly after receiving his commission was assigned to an artillery regiment commanded by Baron Duteil, “perhaps the most distinguished gunner in the French army” (Marshall-Cornwall, Napoleon as Military Commander). The Baron was extremely impressed by the cadet officer, who had not yet been under fire, and helped him as much as he could. And the scarcely credible slackness of a young officer’s life under the ancien régime (when there wasn’t actually a war on) meant that the young Napoleon had plenty of time to supplement his formal education with intensive personal study, not just military theory but also politics and ancient history (Note 2). Nor is this all. After the revolution, virtually all the top officers went over to the royalist side so the fledgling republic needed all the trained soldiers it could find and was ready to promote them accordingly. Nonetheless, Napoleon very nearly lost the chance of a lifetime because he got embroiled in the struggle for Corsican Independence, changing sides more than once, until he finally opted for Revolutionary France. Then, while inspecting the coastal defences of the South of France he had three amazing strokes of luck. (1) The General in charge of the forces near Toulon, Carteaux, was incompetent and soon to be relieved of his functions (2) Carteaux’s artillery commander, Dugommier was badly wounded and (3) Napoleon ‘happened’ to come across a certain Saliceti, an old Corsican friend of the family, now a leading politician in the Paris Convention. Saliceti arranged for the promising but still relatively inexperienced officer, scarcely out of his teens, to be put in charge of the artillery for the relief of Toulon. As Marshall-Cornwall says, “It was a strange combination of circumstances”. Toulon was the first and most important ‘tipping point’ in Napoleon’s career and though it was ‘Fortune’ that gave him the golden opportunity, it was Napoleon who seized it firmly with both hands and never let it go. One can even perhaps detect a certain note of respect for a gallant enemy in a contemporary English newspaper’s mention of Buonaparte by name (unearthed by Trevelyan) ─ “Lieutenant Buonaparte has been killed in one of the recent encounters before Toulon”. Toulon was, militarily speaking, an awesome performance and at the age of 24 the young artillery officer found himself promoted to général de brigade ( Brigadier) skipping all the intermediary ranks including Colonel. This could surely never have happened in any national army in the world except perhaps for an American during the American War of Independence. Shortly before the successful conclusion of the siege, Napoleon was brought to the notice of a ‘political commissar’ ─ one feels oneself already in the 20th century ─ sent by the Paris Convention to scout around for promising talent, but doubtless also to check on people’s political correctness. The person in question was a Royalist officer turned Republican, Paul Barras. This remarkable man was to play a key role in Napoleon’s life since he later downloaded onto him an aging mistress, Josephine de Beauharnais, and, more important still, provided Napoleon with his first chance to show his political mettle. It is well to remember that it was Barras that spotted Napoleon and not the reverse, and that Napoleon came to his notice not through social contacts but by his actions. Although Barras was an opportunist who wanted to use Napoleon for his own purposes, the other senior figures, the two du Teils and Napoleon’s new superior General Dugommier, all war-hardened veterans, seem to have been literally spell-bound by the young officer, somewhat as Beauregard was spell-bound by Jeanne d’Arc. We do not know at what point Napoleon decided he wanted not only military but political power as well. Actually, he did not have a lot of choice. While the chaotic aftermath of the French Revolution gave able young officers like Napoleon their chance, it also made them extremely vulnerable to the vicissitudes of party politics. After such a brilliant start Napoleon was briefly imprisoned when the Jacobins were guillotined since he had been on good terms with the younger Robespierre. The ever ready Corsican Saliceti came to his aid, arguing that France needed officers like Napoleon ─ but from then on he was regarded by the authorities with some distrust, though returned to his duties. After the collapse of the first attempt to invade Italy (with plans partly drawn up by Napoleon himself), Napoleon must have felt that his promising career had been nipped in the bud. There he was, poor, regarded with some suspicion at Paris and despite his striking looks, gauche and unsuccessful with women. But Barras was now the leading figure of the Directory. This man, even more than Napoleon in a sense, was an absolute master of what I call Eventrics since, incredibly, while starting off as a Royalist officer, he went through all the vicissitudes of the Revolution unscathed, changing sides exactly at the right time and like a political Soros always backing the winner. In 1795 Napoleon was called to the bureau topographique (sort of Planning Office) in Paris. The political situation was extremely serious : the poorer population of Paris, feeling that the revolution had been snatched out of their hands by a lot of devious politicians and currency speculators, were getting ready for the third stage of the Revolution. Barras was granted full powers to restore order while the other members of the new government barricaded themselves in the Tuileries. Napoleon’s job was to quell the revolt. According to Johnson, on 13 vendémiaire (5 October) about 30,000 malcontents, many of them armed, rampaged through the centre of Paris. This sounds like an enormous number of people given the smaller populations at the time and much of Paris was an ideal battleground for urban guerrilla ─ as parts of it remained right up to the ‘student revolution’ of May 1968. It is not clear whether Buonaparte seized this second opportunity to distinguish himself because of ambition, or because of conviction (most likely both). Politically, apart from being a Buonapartist, Napoleon was what we would today consider ‘Centre-Left’. He was sincere in his dislike of the ancien régime, opposed to the power of the Catholic Church, believed everyone should be equal before the law and was an active patron of the arts and sciences. But, like all other ‘middle-class’ people at the time, he would have been horrified by the idea of giving power to ‘the mob’ (Note 3). Buonaparte applied the Machiavellian principles to the letter. He realized that in hand-to-hand fighting the rebels, even if poorly armed, would probably get the upper hand by sheer weight of numbers. His plan, then, was to lure the rioters away from the lethal alleyways of much of central Paris into an open space, of which there were not so many then, where he could unleash his artillery on them. Fortunately for him, the Tuileries, siege of the government and target of the populace’s anger, did have some open space around it. Johnson goes so far as to suggest that Napoleon deliberately chose ‘grapeshot’ rather than balls or shells because “it scattered over a wide area, tending to produce a lot of blood” but maiming rather than killing its victims. If this is the case, Buonaparte possibly did the ‘right thing’ ─ or so at any rate Machiavelli would have said ─ since it was more politically expedient (and even more humane) to frighten once and for all than to kill. A heavy initial death toll after a massed charge would have enraged the assailants and made them even more desperate, thus more dangerous. As it was, the operation went off as successfully as the raising of the siege of Toulon : the mob recoiled, bloodied and terrified out of their wits by the noise of the big guns at point-blank range, and never got together in such numbers again until the July Revolution of 1830 by which time Napoleon was long dead. Napoleon’s career is almost too pat as a study in Eventrics power politics. First, an ideal situation to step into, two ‘moments of opportunity’, one military and one political, a steady ascent to absolute power, finally decline due to overconfidence and unnecessary risk-taking (invasion of Russia). When the tide of events left him stranded, his dash and mastery changed to bluster and obstinacy. Napoleon could easily have got a better deal for himself, and certainly for France, if he had accepted the Allied offers of returning France to its 1799 or 1792 frontiers instead of fighting on against Allied forces that outnumbered him eight or ten to one. And most historians think that, even if he had won the Battle of Waterloo after his return from Elba (which he nearly did), he could never have remained in power. Nothing particularly surprising here from the point of view of ‘Eventrics’, simply the trap of believing yourself to command events when they always, at the end of the day, control you. Note 1 Surprisingly, Thomas Cromwell, Henry VIII’s (for a while) all-powerful minister, was the son of a Putney blacksmith. But Thomas Cromwell’s position was always precarious and he did not last long. Henry VIII put into practice Machiavelli’s golden rule of getting someone to do the dirty work and, then, when his services were no longer needed, getting rid of him, thus earning the gratitude of the common people. Machiavelli praises Cesare Borgia for putting Remiro d’Orco, “a man both cruel and efficient” in charge of the Romagna. Note 3 Today, at a safe distance of two centuries, one tends to feel sympathetic to the rioters and, as a socialist and a romantic, I used at one time to think that “the people” were automatically in the right especially when attacked by the military. However, I hardly think much good would have come of this popular uprising : there would just have been more pointless bloodshed and general chaos. In effect, the ‘Third Revolution’ was postponed until the 1871 Paris Commune. In this case grape-shot was not enough : some 22,000 people, mainly civilians, were killed in a single week, the notorious ‘semaine de sang’ 21-28 May 1871. Power ─ what is power? In physics it is the rate of ‘doing Work’ but this meaning has little or no connection to ‘power’ in the political or social sense. Power is the capacity to constrain other people to do your bidding whether or not they wish to do so. This sounds pretty negative and indeed power has had a bad sense ever since the Romantics from whom we have never really recovered. Hobbes spent a good deal of his life trying to persuade the ‘powers that be’ of his time, i.e. King and/or Parliament, to make themselves absolute ─ even though he himself was exactly the sort of freewheeling and freethinking individual no absolute ruler would want to have as a citizen. But Hobbes lived through the Civil War which the Romantics didn’t. Prior to the nineteenth century most people of all classes were more afraid of the breakdown or absence of power (‘chaos’, ‘anarchy’) than of ‘abuse of power’: indeed they would find modern attitudes not only misguided but scarcely comprehensible. If you wish to live in society, there has to be some way of constraining people since otherwise everyone pulls in different directions and nothing gets done. If you don’t believe me, go and spend a few weeks or even days in a situation where no one has power. I have lived in ‘communities’ and they are intolerable for this very reason. What usually happens is that someone soon steps into the power vacuum and he (less often she) is the person who shouts loudest, pushes hardest, is the most unscrupulous and generally the most hateful ─ though sometimes also the most efficient. In more traditional communities it is not so much the more assertive as the ‘older and wiser’ who wield the power, the obvious example being the Quakers. This sounds a lot better but in my experience it isn’t that much of an improvement. People like the Quakers who forego the use of physical force tend to be highly manipulative ─ they have to be ─ and it would be quite wrong to believe that a power structure in the Quakers or the Amish does not exist for it certainly does. In fact no society can exist for more than a month without a power structure, i.e. without someone (whether one or many) holding power. So, my thesis is the unoriginal one that some form of power invested in specific human beings (whether initially elected or not) is inevitable and not necessarily a bad thing. Lord Acton was being extremely silly when he made the endlessly repeated statement “All power corrupts, absolute power corrupts absolutely” with the implication is that it is better to keep away from power altogether. Although I don’t know much about Lord Acton’s life, I can be pretty sure that he didn’t know what it was like to be powerless. One could just as well say, “All lack of power corrupts, absolute powerlessness corrupts absolutely”. It is lack of physical or financial muscle that makes people devious, treacherous, deceitful : one more or less has to be like this to survive. And it is simply not true that ‘absolute power corrupts absolutely’. You can’t get much nearer to absolute power than the position of the Roman Emperor. But Rome produced one or two quite good Emperors, e.g. Augustus himself and Hadrian, also one entirely admirable, indeed saintlike (though woefully ineffective) one, Marcus Aurelius. President Obama has currently more power in his hands than anyone who has ever existed, at least in the military sense, and although not everyone agrees with his policies not even his enemies have accused him of being corrupt or corrupted by power. One alarming and unexpected aspect of the dynamics of power is that when an existing power structure is overthrown, the ‘order’ that emerges from the usually brief period of chaos is a good deal more restrictive than what preceded it, witness the Commonwealth under Cromwell, Russia under Stalin &c. &c. In the ‘mini-revolution’ of Paris in May 1968, I and one or two others, watched open-mouthed, hardly believing what we were witnessing, as a single individual, in whom at one stage most of us had full confidence, concentrated all the power of an occupied University faculty into his hands exactly like Robespierre or Stalin. And he did it without striking a blow. Actually, such a dénouement is virtually inevitable ─ or at any rate the danger of such a development will always be there. Immediately after a revolution there is usually a counter-attack by the ousted elite, so the revolutionaries find themselves with their backs to the wall. In such a situation, it is survival that counts, not liberty ─ because if you, or the social order you represent, don’t survive, then there won’t be any more liberty either, it will just be ancien régime all over again, only worse. So the revolutionaries enact repressive legislation to protect themselves, legislation which is rarely repealed when things eventually calm down. Why am I writing a post about power on this site? Because, as a friend has just this very day reminded me, I must beware of giving the impression that ‘Eventrics’, the theory of events and their interactions, only deals with invisible ‘ultimate events’, equally invisible ‘Event Capsules’ and generally is about as irrelevant to everyday life as nuclear physics. Ultimate Event Theory is the microscopic branch of Eventrics but the theory applies right across the board and it may be that its strength will be in the domain of social thinking and power politics. Just as the physics of matter in bulk is very different from the physics of quarks and electrons, that part of Eventrics that deals with macro-events, i.e. with massive repeating bundles of ultimate events that behave as if they were independent entities, has on the face of it little in common with micro-eventrics (though presumably ultimately grounded in it). So what has the Theory of Events and their Interactions to say about power? Well, firstly that it is events and their internal dynamism that drive history, not physical forces or even persons. Mechanics, electro-magnetism and so on are completely irrelevant to human power politics and indeed up to a point the less science you know the more successful you are likely to be as an administrator or politician. Biology is a little more relevant than physics because of the emphasis on struggle but it is all far too crude and ridiculously reductionist to apply directly to human societies. Human individuals certainly do not strive to acquire power in order to push their genes around more extensively : Casanova pushed his around more effectively than Hitler, Mussolini and Cromwell combined. And the widespread introduction of birth-control in Western societies demonstrates that modern human beings are certainly not under the thumb of their ‘selfish genes’ (as even Dawkins belatedly admits). Nor is this the only example. Just as virtue really is its own reward, at least sometimes, so apparently is the pursuit of power, and indeed at the end of the day so are most things. More fashionable contemporary ‘sciences’ such as complexity theory do occasionally have something of interest to say about human affairs but their proponents have yet to make any predictions of import that have come true as far as I know. The financial crash of 2008, only anticipated by a handful of actual investors and traders such as Nessim Taleb and Soros (the former even pinpointed where the bubble would start, Fanny Mac and Fanny Mae), makes a mockery of the application of mathematics to economics and indeed of economics in toto as an exact science. The reason for official science’s impotence when addressing human affairs is very easy to explain : almost all living scientists are employed either by universities or by the State. That is, they have never fought it out in the cut-throat world of business nor even, with one or two exceptions, dirtied their hands with investment, have never been under fire on a battlefield or even played poker for money. But it is in business, warfare and gambling that you can detect the ‘laws’ of power inasmuch as there are any, i.e. how to acquire power when you don’t have it and how to keep it when you do. Hitler was an auto-didact dismissed as a buffoon by the Eton and Oxbridge brigade that staffed the Foreign Affairs Department then as now : but he ran rings around them because he had learned his power politics strategy at the bottom, in the hard school of Austrian YMCA Hostels and German beer-halls. There are most likely no specific laws of power in the sense that there are ‘laws of motion’ but there are certain recurrent features well worth mentioning. They are ‘qualitative’ rather than ‘quantitative’ but this is as it should be. It is stupid to put numbers on things like fashions and revolutions because it is not the specifics that matter, only the general trend. Indeed, the person who is obsessed with figures is likely to miss the general trend because the actual shapes and sizes don’t look familiar. Rutherford’s much quoted remark that “Qualitative is just poor quantitative” may have its uses in his domain (nuclear physics), but in human affairs it is more a matter of “quantitative is lazy or incompetent qualitative”. So what noticeable trends are there? One very general feature, which sticks out a mile, is the ‘tipping point’ or ‘critical mass’. Malcolm Gladwell, a non-scientist and a qualitative rather than quantitative thinker, wrote a justly praised bestseller called The Tipping Point, which demonstrates his sound understanding of the mechanisms at work. A movement, fashion, revolution &c. must seemingly attain a certain point : if it does not attain it, the movement will fail, fade away. If it does attain this point, the movement takes off and it does not take off in a ‘linear’ fashion but in a runaway ‘exponential’ fashion, at least for a while. Anyone who has lived through a period of severe social unrest or revolution knows what I am talking about. My own experience is based on the May 1968 ‘Student Revolution’ in Paris. But much the same goes for a new style in clothes or shoes : indeed fashions have something alarming precisely because they demonstrate power, sudden, naked power which sweeps aside all opposition. The fashion industry is in its way as frightening as the armaments industry and for the same reasons. OK. There is a ‘tipping point’ (generally only one) and, following it, a consequent sudden burst of momentum : these are the first two items worth signalling. And these two features seem to have very little to do with particular individuals. It is the events themselves that do the work : the events pull the people along, not the reverse. Companies that found they had launched a trend overnight ─ Gladwell cites the Hush Puppies craze ─ were often the first to be surprised by their own success. As for political movements, I know for a fact, since I was part of the milieu, that the French left-wing intelligentsia was staggered out of its wits when a few scuffles in the Sorbonne for some reason turned almost overnight into the longest general strike ever known in a modern industrialized country. This general point (that it is not human beings that direct history) needs some qualification, however. There are indeed individuals who unleash a vast movement by a single act but this happens much less often than historians pretend, and usually the result is not at all what was intended. Princeps, the high-school boy who shot the Archduke at Sarajevo and precipitated WWI did have a political agenda of a kind but he neither wished nor intended to cause a European war. And there are indeed also individuals who mark history in a big way and mean to do so, but they achieve their aims more often than not by ‘going with events’ rather than by attempting to instigate series of events themselves or, worse still, deluding themselves that they are in complete control of the course of events. In other words, they are people who have an instinctive sense of the underlying principles of Eventrics and know how to use these forces to their personal advantage. And the word ‘instinctive’, hated by all rationalists and scientists, is the key word here. Cromwell, a man who rose from being an obscure country squire to become Lord Protector is supposed to have enunciated the astounding dictum, “No man rises so high as he who does not know where he is going.” Hitler, an even more striking case of a ‘man from nowhere’, compared himself at one point to a ‘sleepwalker’ ─ “I go to my goal with the precision and assurance of a sleepwalker”. To recap. We already have a few features to look out for. (1) tipping point; (2) sudden, vertiginous take-off when there is a take-off; (3) lack of anyone instigating or controlling the movement but (4) certain individuals who achieve what seems to be impossible by simply ‘moving with the events’. Today we tend to trace the study of power back to Machiavelli and certainly it would be foolish to downplay his importance. Nonetheless, the historical situation in which Machiavelli worked and thought, Quattrocento Italy, is completely different from the modern world, at any rate what we call the ‘advanced’ modern world. Would-be rulers in Machiavelli’s time acquired power either by being promoted by some clique or by direct annexation and murder. But no 20th century head of an important state acquired power by a coup d’etat : he or she generally acquired it by the ballot box — and incredibly this even applies to Hitler who obtained the votes of a third of the German population. And though Machiavelli does have some useful things to say about the importance of getting the common people on your side, he has nothing to say about the power of political oratory and the use of symbolism. Possibly, the sort of brazenness that Machiavelli advocates actually did work in the Italian Quattrocento world of small city-states and condottieri. VBut even then it would certainly not have worked in any of the larger states. No one who aims at big power admits duplicity or advocates its use; if you are ambitious, the first person you usually have to convince is yourself and this is no easy task. You have to carry out a sort of self-cheat whereby you simultaneously believe you really are acting for the general good while simultaneously pursuing a ruthlessly egotistical policy. This is not quite hypocrisy (though perilously close to it): it is rather the Method actor temporarily ‘living the role’ ─ and running the risk of getting caught in his own noose. Indeed it is because Machiavelli has a sort of basic honesty, and hence integrity, that no clear-sighted upstart ruler would want to give such a man high office ─ he would either be utterly useless or a serious danger because too formidable. And, interestingly, the Medicis did not employ Machiavelli although he was certainly angling to be taken on by them. Awe has a religious rather than a military sense though the great commanders of the ancient world, Alexander, Caesar, Hannibal, had the sort of aura we associate more with religious leaders. Time and again isolated figures with what we vaguely, but not inaccurately, call ‘charisma’ have suddenly attained enormous power and actually changed the course of history : the obvious example being Joan of Arc. Hitler, having failed to ‘shock’ the country, or even Munich, by holding a revolver to the Governor of Bavaria (literally) and rampaging around the streets with a handful of toughs, was sharp enough to realize that he must turn to awe instead, using his formidable gifts of oratory to obtain power via the despised ballot-box. Mahomet did fight but no one doubts that it was his prophetic rather than strictly military abilities that returned him against all odds to Mecca. What of Christ? It seems clear that there were at the time in Palestine several movements that wished to rid the country of the Romans (even though they were by the standards of the time quite tolerant masters) and to revive the splendours of the House of David. There is some hesitation and a certain ambivalence in Christ’s answer under interrogation which suggests he had not entirely made up his mind on the crux of the matter, i.e. whether he did or did not intend to establish himself as ‘King of the Jews’. He did not deny the attribution but qualified it by adding “My kingdom is not of this world.” This is a clever answer to give since it was only Christ’s political pretensions that concerned the Romans, represented here by Pontius Pilate. It is not an entirely satisfactory answer, however. If a ‘kingdom’ is entirely of, or in, ‘another world’, one might justifiably say, “What’s the use of it, then?” Christianity has in fact changed the everyday here-and-now world enormously, in some ways for the better, in some ways not. And Pontius Pilate’s blunt refusal to remove the inscription, “Jesus of Nazareth, the King of the Jews” suggests that Pilate thought the Jews could have done a lot worse than have such a man as ‘king’. It seems probable that some of Christ’s followers, including one disciple, wanted to nudge Christ into taking up a more openly political stance which, subsequently, it would have been difficult to draw back from. According to this interpretation, Judas did not betray Christ for money or protection : he tried to bring about an open conflict ─ and he very nearly succeeded since Peter drew his sword and struck off the servant of the High Priest’s ear in the Gethsemane stand-off. But Christ seemingly had by now (after a final moment of intercession and prayer) decided to stick entirely to ‘awe’ as a means of combat with the forces of evil (in which he clearly believed). In a sense, Christ was not so much a victim as a resolute and exceedingly skilful strategist. No one expected him to give in and actually be put to death as a common felon, and for a moment Christ himself seems to have been hoping for a miracle hence the cry “Why, oh why hast Thou forsaken me?” (a quotation from Isaiah incidentally). It has been suggested by certain commentators that Christ was using ‘goodness’ and the respect and awe it inspires to actually take the ‘Evil One’ by surprise and, as it were, wrong-foot him. Seemingly, there are suggestions of this ‘unorthodox way of combatting evil’ in the writings of the Old Testament prophets which Christ knew off by heart, of course. And, incredibly, the stratagem worked since Christ’s small band of followers rallied and went from strength to strength whereas the other Jewish would-be Messiahs of the time who really did take up arms against the Romans perished completely ─ and provoked the greatest disaster in Jewish history, the complete destruction of the Temple and the diaspora. Certainly there are moments when ‘awe’ without shock works. Saint Francis, Fox, the founder of the Quakers, Gandhi and Martin Luther King have all used the ‘awe’ that a certain kind of disinterested goodness inspires to excellent effect. It is, however, a perilous strategy since you have to be prepared to ‘go the whole way’ if necessary, i.e. to die, and the public is not likely to be easily fooled on this point. This has taken us some way from the original subject but my advisor told me I ought to ramble more if I want to get more readers. The case of Christ is a very interesting case viewed from the standpoint of Eventrics. But before examining it in more detail, may I make it clear that by analysing the behaviour of figures such as Christ or Mahomet in terms of event strategy, no offence to religious people is intended. Eventrics, like all sciences is ethically neutral : it merely studies, or purports to study what goes on. But as a matter of fact, most great religious leaders had a pretty good grasp of day to day tactics as well. Charisma by itself is not enough, and Christ himself said, “Be as cunning as serpents and as innocent as doves”. The trouble with the ‘innocent’ is that they are usually completely ineffective, either because they don’t understand Realpolitik or consider it beneath them. But there is actually not a lot of point in being ‘good’ if you don’t actually do any good ─ at any rate from society’s point of view. And there is a way of getting things done which is identical whether you are good or bad. Nor need the ‘good’ person feel himself or herself to be as much at a disadvantage as he usually does. Bad people themselves have weak points : they tend to assume everyone else is as selfish and unscrupulous as they themselves are and in consequence make catastrophic errors of judgement. The really dangerous bad person is the one who understands ordinary people’s wish to be ‘good’, at least occasionally, ‘good’ in the sense of unselfish, ready to devote oneself to a higher cause and so on. Hitler was able to simultaneously play on people’s baser instincts but also on their better instincts, their desire not only to be of service to their country but to sacrifice themselves for it (Note 1). Christ at the zenith of hi8s mission was swept along by what seemed a well-nigh irresistible tide of events fanned by the growing irritation with Roman rule, the preachings of holy men like John the Baptist, widespread expectations of a sudden miraculous cataclysm that would wind up history and bring about the Jewish Golden Age, and so on and so forth. Christ was borne along by this current : it took him into the lion’s den, Jerusalem itself, where he was acclaimed by an adoring multitude. So far, so good. The tide was strong but not quite strong enough, or so Christ judged. The most difficult thing for someone who has a string of successes behind him is to pull out at the right moment, and very few people are capable of doing this since the power of the event-train not only exerts itself on spectators but above all on the protagonist himself. He or she gets caught in his own noose, which only proves the basic law of Eventrics that it is events that drive history not the person who directs them, or thinks he does. Over and above any moral priority which puts pacifism higher than combat, or a desire to broaden his message to reach out to the Gentiles, on the strictly tactical level Christ seemingly judged that the Jewish resistance movement was not strong enough to carry the day against the combined force of the official priesthood and Rome. So he decided to combat in a different way ─ by apparently giving in. He withdrew deliberately and voluntarily from the onward surge of events and, miraculously, this unexpected strategy worked (but only posthumously). It is the same thing with gambling. Despite all the tut-tutting of scientists and statisticians who never risk anything and know nothing about the strange twists and turns of human events, I am entirely convinced that there really is such a thing as a ‘winning streak’, since successive events can and do reinforce each other ─ indeed this is one of the most important basic assumptions of Eventrics. What makes gamblers lose is not that they believe in such chimeras as ‘runs’ or ‘winning streaks’ : they lose because they do not judge when it is the right moment to leave the table, or if they do judge rightly do not have the strength of character to act on this belief. They are caught up by the events and taken along with them, and thus become helpless victims of events. There is I believe a Chinese expression about ‘riding’ events and this is the correct metaphor. A skilful rider gives the horse its head but doesn’t let it bolt ─ and if it shows an irresistible inclination to do so, he jumps off smartly. Note 1 Curiously, at least in contemporary Western society, there is not only very little desire to be ‘good’, but even to appear to be good. Bankers and industrialists in the past presented themselves to the public as benefactors, and some of them actually were (once they had made their pile): this is a million miles from the insolent cocksureness of “Greed is good”. We have thus an unprecedented situation. People who not only lack all idealism but scorn it are very difficult to manipulate because it is not clear what emotional buttons to push. Today Hitler would never get anywhere at all, not just because his racial theories don’t really hold water but, more significantly, because most people would just laugh at all this high-sounding talk about the “fatherland” and “serving your country”. This clearly is a good thing (that Hitler wouldn’t get anywhere today), but one wonders whether a rolling human cannon, a lynch mob looking for someone to lynch (anyone will do) may not turn out to be an even greater danger. In terms of Eventrics, we now have large numbers of people literally “at the mercy of events” in the sense that there are today no ringleaders, no people calling the shots, no conductors of orchestras, only a few cheerleaders making a lot of noise on the sidelines. The resulting human mass ceases to be composed of individuals and event dynamics takes over, for good or ill. The charismatic power figure has himself become outdated, irrelevant : it is Facebook and Google that control, or rather represent, the future of humanity but who controls Facebook and Google?